something like a year ago, I received an email from the assistant of a french author who asked if I might like to be part of a photobooth book. there was to be no financial compensation but might I be interested? well, yes. 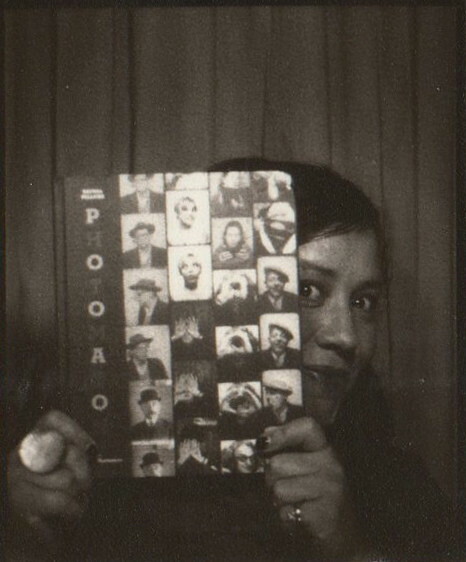 a french photobooth book? YES. ABSOLUTELY YES. the very thought of my photobooth frames appearing on the pages of a french photobooth book had me over the moon, pay or no pay. I mean, even if never saw the finished product, never got to hold the book with my own two hands. the very thought. in the months that followed, there was a little back and forth regarding which photobooth frames would be used in the book and could I write a little something about my experience with photobooths? yes, of course I could and then, I don't know. I just sort of forgot about the whole thing. in december, I received an email informing me the book was finished and could I please send my mailing address so they could send me a copy? again, over the moon at the prospect but the craziness of december set in and again, I forgot all about it. until january 27th, that is. which is when I found myself in san francisco at the moma (henri cartier bresson show= part of that belated 40th birthday adventure). more specifically, I found myself standing in the gift shop in front of an enormous book display. which is when I spied a new photobooth book. which, of course, I promptly picked up and thumbed through. wow, I thought. wow. this is great, this is fantastic. pages and pages of terrific photobooth frames and the work of so many amazing photobooth artists. daniel minnick (a long time favorite of mine) and so many others. the work of lovely fellow polaroid photographer jena ardell and my good friend and fellow photographer cori kindred. wow, I thought. why couldn't I have been part of a book like this? I WOULD KILL TO BE PART OF A BOOK LIKE THIS. friends, at that exact moment, the book fell open to the spread with my photobooth frames, my words, my name across the top. at once, I remembered. 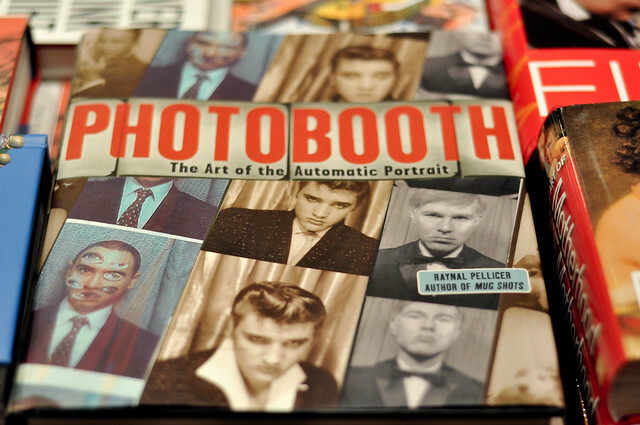 the french photobooth book! this is that french photobooth book! except this one was in english and it was here, in my hands. here, in the middle of the moma gift shop downtown san francisco. it was a moment, I tell you. an extraordinary little moment. and almost five years to the date of when I first started the photobooth friday project. fancy that. one week later, I received the french version of the book in the mail. that night, I stuffed that beautiful little photomaton book in my bag and made my way down to the nearest photobooth. but of course, my friends. but of course. also, many many thanks to author raynal pellicer. 'tis an honor to be a part of such a book. so awesome! i am so happy for you & cori!! and i know that feeling. i get super excited every time i see "new york: a photographic album" in a book store here in NYC. i believe you are in that one with me, too, no? Serious awesome amazing news! I'm jotting down the title to buy it this weekend. Congratulations, Andrea! FANTASTIC. i am so happy for you! and so proud! so very proud. you lead a charmed life, i tell you. congrats! That is seriously awesome. What a fun series of events!!!! :D Thanks for the smile. That's amazing Andrea! I'm so excited for you. What an incredible honor! That's fantastic Andrea! I'm really happy this happened to you. wow! that is so absolutely perfectly fabulous! i love this. i love the glimpses of your life over the years and how this little project has developed. and i looove that you are in a book about it! it is now number one on my to-buy book list. congrats and great job! I had a few very small pictures in my state's edition of America 24/7...I entered for the heck of it...and it's still very exciting. The one drawback, every time I see one of those books on clearance, I have to rescue my pictures and bring them home...I have many many copies of that book. So did you buy the book in the MoMA gift shop?! I so hope you did! LOL I had to laugh at your realisation when flipping through the book - totally something I would do. Congratulations! And of all ways to find the book, that's just amazing! I wish I could smooch the heck out of you and your awesome face right now. This is so great. Kinda like a million and one things about you. Can't wait to check this out in person. Congrats times one bajillion, lovely! wow! this had to be quite the highlight. i have big fat goosebumps! And now I have another book to add to the wishlit! That is so awesome! 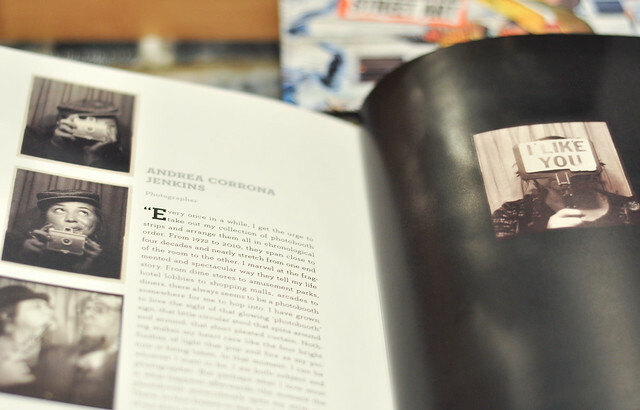 Ha, I can't even imagine the feeling when you saw your own stuff in the book...neat. Congrats to you lady. How very exciting. I really enjoyed your photobooth series. You never cease to amaze and inspire...Happy Weekend. Oh, that is so nice ! Congrats !!! to get my hands on a copy. Quite Incredible! GASP! I love it! So great Andrea :) Congrats! Go photobooth!!! This is splendid! What a lovely surprise, you must have been quite glad that you forgot all about it just for that moment to occur. omg. this is just STELLAR. congrats. hope you are celebrating BIG. i wonder if there is some way for me to order this book? i will start my search...! congrats my friend! and might i say... i am glad it knocked your socks off to find your work there. what a moment! That is fabulous! I loved reading this. How we forget things that affect our lives. The little details do ad up. So cool that you went and found a photo booth & took the photograph with you and the book in hand. Well done! Yeah! Get on, girl! Very cool. That's a fantastic story Andrea! So great that you could have that incredble moment of discovery. The book looks beautiful. How exciting! I'm very happy for you! Congrats! this is awesome! I loved reading your post and how the story unfolded. How exciting for you. Congrats. What an incredible story! I kinda love that you discovered it by accident. You are so awesome. their great attention to detail. Despise not small beginnings ... I've been telling myself that over and over. All of your work/fun has come to meet up with fruition! HOW WONDERFUL! And, as you said, " ... the book just fell open to that page ...!" LOVE THAT! Congratulations!